Scientists reveal the secret of how gypsum forms. One of the Earth's greatest wonders is gypsum, a very soft calcium-based mineral that we use in homes, such as in plasterboard and drywall, and encounter naturally all around the world, such as the stunning formations shown above. Now, reporting in the latest issue of the journal Science, scientists have determined the exact steps in which gypsum forms. It's a remarkable natural example of natural nanotechnology: first, nanoparticles of a chemically similar mineral called bassanite form; second, the nanoparticles coalesce into larger bassanite nanorods; third, the bassanite nanorods form gypsum. Discovering these steps through high-resolution microscopy, Alexander Van Driessche of CSIC-University of Granada in Spain and his colleagues conclude that gypsum and bassanite both here and on Mars may have formed differently than scientists previously thought. In addition this new knowledge opens ways to making gypsum and bassanite more efficiently than before, which may benefit the various industrial applications that use them. One interesting stat from Wikipedia, which probably will find its gypsum entry updated in light of this new paper: the White Sands of Mexico has a natural 270 square-mile reserve of gypsum sand, which is enough to supply the construction industry for 1,000 years, according to a 1999 article in the Albuquerque Journal referenced in the Wikipedia entry. For gypsum in the years 2999 and beyond, and bassanite, industrially important in its own right, manufacturers might find these newly uncovered details of nanoassembly increasingly useful for making these minerals. 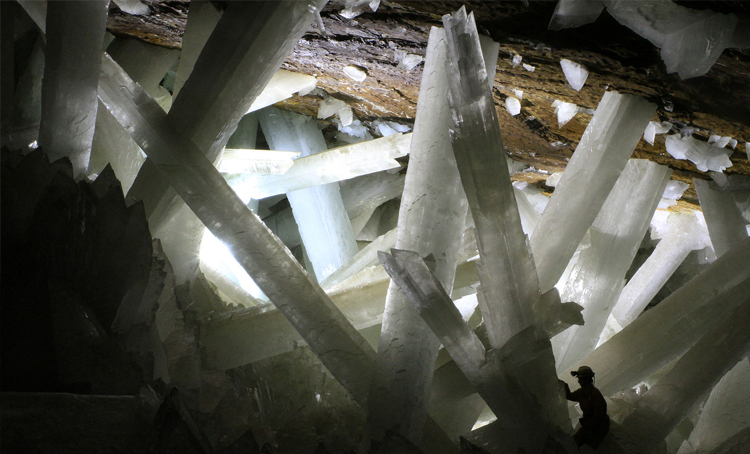 As the giant gypsum crystals show, nature has certainly been successfully following these steps for millions of years at a time.